At first glance, the concept of using only five actors to fill 39 roles in a stage adaptation of Jules Verne’s adventure classic seems nothing more than a gimmick. What a delight, then, when it quickly becomes apparent that the tactic is integral to Mark Brown’s adaptation and that director Allison Bibicoff’s fast-paced staging is breezily funny. 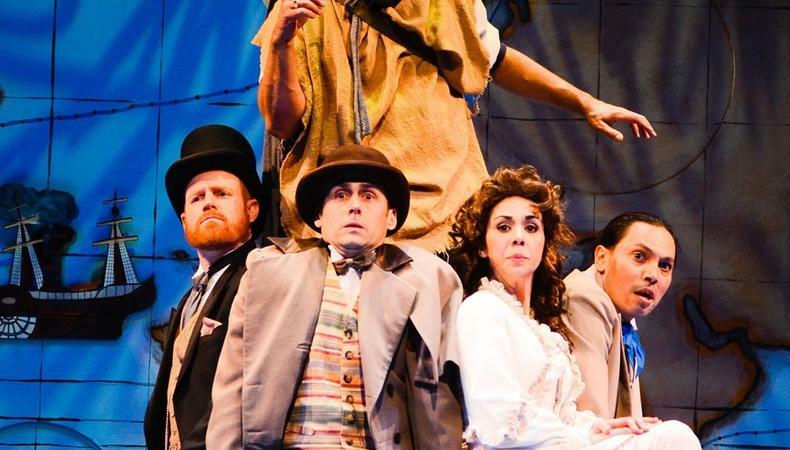 Watching Phileas Fogg surmount a succession of obstacles in circumnavigating the globe in 80 days is highly satisfying, as is seeing the versatile cast overcome the challenges raised by script and story. The actor-character breakdown is more lopsided than simply dividing 39 by five. Jud V. Williford, Michael Uribes, and Melinda Porto—the actors taking the three primary roles—essay few others, leaving upward of 30 characters split between the remaining two performers, Mark Gagliardi and Brian Stanton. Williford’s Fogg is logical, dryly scientific, and almost incredibly resourceful, a coolly proper Englishman of extraordinary discipline who is almost machinelike in his approach to life. Uribes is primarily—and expertly—used as Fogg’s faithful French manservant Passepartout, limning him as endearingly kind, polite, and childlike. Porto is mostly employed as Aouda, the beautiful widowed princess whom Fogg rescues while in India. The actor crafts a woman as modest and demure as she is intelligent, charming, and beautiful, one who’s deeply moved by Fogg’s chivalry and honor. Porto also shines as a few male characters: a mustachioed cockney newsboy, a red-bearded salty sailor, and the stuffily proper valet whom Fogg sacks at the play’s start for failing to heat his shaving water to the exact temperature desired. Stanton’s version of comical obsession informs his Detective Fix, a superficially capable yet spectacularly inept Scotland Yard lawman who dogs Fogg during the entire journey in the belief that he’s a wanted bank robber. Stanton also makes a splash as Stewart, the dry Brit who proposes the wager that Fogg can’t possibly complete the trek of the title, and as the loyal guide who leads Fogg through India on an elephant. Gagliardi’s quick-change skills enhance a gravel-voiced India regiment officer, a Yosemite Sam–like American cowboy who detests everything about Fogg, and a nearly endless gallery of rogues, ruffians, police officials, gentlemen, and clerks, all delivered with obvious relish. Staci Walters’ set— a large upstage map of the world tracing Fogg’s route and its major stops—embodies the staging’s simplicity. Doors cut into the map allow for quick entrances and exits, while windows let the actors pop their heads through à la “Laugh-In.” Kim DeShazo’s beautifully detailed costumes offer a range of looks. Though hardly deep and primarily played with tongue in cheek, “Around the World in 80 Days” never slides into parody, often exhibiting emotions that are relatable and touching. Brown and Bibicoff treat Verne’s tale with the same respect the author always showed to even his most outlandish fictional creations. Presented by International City Theatre at the Long Beach Performing Arts Center, 300 E. Ocean Blvd., Long Beach. Jan. 25–Feb. 17. (562) 436-4610 or www.internationalcitytheatre.org. Casting by Michael Donovan.